"This recipe is great on the grill. Dad uses a grill pan, and cooks according to oven directions. Usually the ham is in the oven so the grill works for us. A wonderful addition for Easter. The lamb and ham taste wonderful together. Source: Mom and Dad. " Spread butter generously over the lamb, and distribute garlic clove halves over the meat. Sprinkle with rosemary and pepper. Place the lamb on a rack inside a roasting pan. Roast the lamb in the preheated oven for 1 hour. Mix the lemonade concentrate and dry soup mix together in a bowl, pour over the lamb, and roast an additional 30 minutes. A meat thermometer inserted into the thickest part of the lamb should read 120 degrees F/58 degrees C for medium-rare or 145 degrees F/68 degrees C for medium-well. Allow the roast to stand for about 20 minutes before slicing. 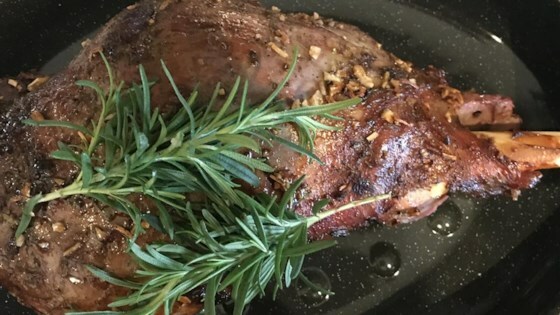 See how to season and roast a juicy, tender leg of lamb. Thought this recipe came out very tasty indeed. The lemonade helps to create a crusty-goodness of sugar on the lamb. Will definitely do this again! Awesome! Made this for Christmas dinner. It was a hit! Would not change a thing! Excellent! My first leg of lamb and the whole family loved it! OMG!!!!!! This is a must do. Fabulous super easy and extremely good you must try !